Harold Lloyd was born in Burchard, KS, April 20, 1893. His parents divorced when he was young, and he lived with his father who tried several ventures, usually without success. According to his autobiography, he and his father decided to find success elsewhere and flipped a coin to determine whether to go east or west. The coin toss sent them west, and they landed in San Diego. There he acted in school stage productions and local theatrical productions. When Thomas Edison's motion picture company came to town, he gained his first film work mainly based on his ability to do make up (in one film as a Yaqui Indian). 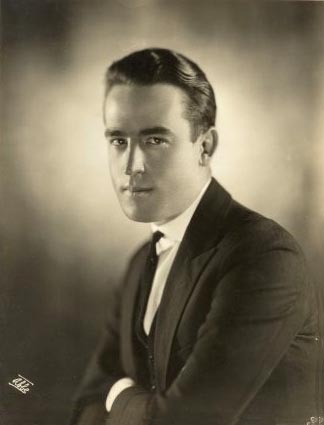 With a move to Los Angeles, he worked for awhile with Mack Sennett, but it was at Universal that he struck up a friendship with Hal Roach. Roach had come into a small inheritance and wanted to use the money to start up his own studio. Lloyd's collaboration with Roach resulted in the Willie Work character which later evolved into a more successful Lonesome Luke character, both brash, knockabout characters along the pattern of Charlie Chaplin's Keystone work. Between 1915 and 1917, these provided some success for the partners; however, by 1917, Lloyd wanted a change and came up with the glasses character after seeing a film about a preacher who wore glasses but bravely rose to the occasion when necessary. Starting out as one-reelers, this new character met with such success that Lloyd began making two-reel comedies in 1919. The character had also evolved with less slapstick and stronger story lines. Lloyd's success was helped by the addition of teenager Bebe Daniels in 1914 who was both a perfect foil and romantic interest in his films. The two were also involved romantically offscreen during this time. Daniels' popularity was such that by 1919, she left Lloyd to work for Cecil B. DeMille and enjoyed a successful film career during the next two decades. Lloyd hired Mildred Davis, an actress who had done some minor comedy work, to co-star in his films. She basically retired from film work when they married in 1923, a marriage that lasted until her death in 1969. In August 1919, Lloyd was posing for some promotional photos with the Witzel Studio when he picked up what he thought was a fake bomb, lit it and proceeded to light a cigarette from the burning fuse. Fortunately he put his hand down to speak to the photographer when the bomb went off. Lloyd lost the thumb and index finger on his right hand and for a while during his lengthy recuperation, he wasn't sure if his career had come to an end or not. However, he did recuperate sufficiently, and, with the help of a prosthetic glove, he continued his career gaining more and more success along the way. Lloyd made some three-reelers in 1920, but had not ventured out into feature length films until a proposed two-reeler, "A Sailor Made Man" (1921) ended up being four reels. From this point on, Lloyd continued in features making a total of 11 during the 1920's. His popularity and the income generated from his films was second only to Chaplin. Davis co-starred in Lloyd's first four features, but with "Why Worry?" in 1923, he found a new co-star, Jobyna Ralston, who had also been working in comedy shorts. She remained with him through his next six features leaving only prior to his last silent feature, "Speedy" (1928). Lloyd made seven sound features between 1929 and 1947; however, his popularity did not match that of his silent features. Actually, he had retired after "Professor Beware" (1938), but was enticed back to work for Preston Sturges in one last film, "The Sin of Harold Diddlebock" (1947), an unfitting end to the master comedian's career. Retaining rights to all of his films, Lloyd made two compilation films, "Harold Lloyd's World of Comedy" (1962) and "Harold Lloyd's Funny Side of Life" (1963), both of which were well received and brought renewed praise for the comedian's work. Lloyd passed away in 1971 at the age of 77 at the magnificent estate he and Mildred Davis built in the 1920's (Greenacres).